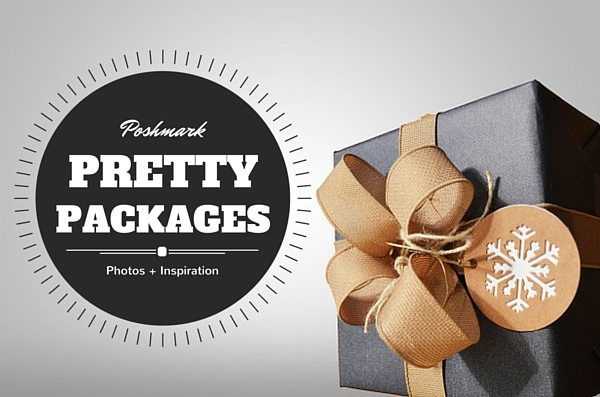 Super cute Poshmark package inspiration! Ladies, it is so, so important that we pay attention to the packages that we send out through Poshmark. Think about when you get a package. Obviously, you want what’s in the box since you ordered it. But have you ever gotten a package that felt like a present while you were opening it? Have you ever received a package in the mail that was purely delightful to unwrap, no matter the contents? The first time that I realized the value of gorgeous packaging was when I ordered some vitamins online from a young, brand new company. Vitamins, seriously. How boring! But when I opened the box, it was filled with colorful crinkle cut fill and there was a super adorable card on the top thanking me for my purchase and explaining a bit about the new company. There were even confetti hearts!! The vitamins went from boring to something that I instantly wanted to order again just to get another pretty package. On Poshmark, we can provide the same experience to our buyers. And it doesn’t have to be expensive! 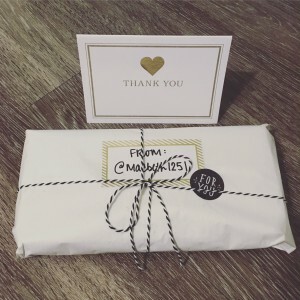 This was Bethany’s FIRST Poshmark package!! She really got the hang of it right from the start and has made many more sales since. I absolutely love the idea of including your Poshmark username on the package. If a buyer is completely delighted with the beautiful package that shows up on their doorstep, they might go back and check out your closet again. After reading way too many blog posts the best advice I’d heard so far from power users was to create your brand. I had seen several photos of adorable posh packages in floral print, colorful stripes, animal print, etc. I loved that they were all different. Each expressed the sellers personal style. Personally, I’ve been into minimalism a lot lately..(Hasn’t everyone?) So I’ve opted to keep things simple with some classic black, white, and gold. Can’t go wrong with that! Bethany’s use of minimalism is consistent in her branding. It is reflected both in her chic packaging and the lovely listing photos in her closet. One of the definite upsides of embracing minimalism on Poshmark is that it is ultra-clear what you are selling in each listing. And that is one of the key elements of creating a good experience for buyers. Check out Bethany’s Poshmark closet here! As a former Sales Manager for Timeshare, First Impressions are the key to success. The first thing they see is the package. It will either bring a Smile with a favorable impression or not. The packaging stages the mood if the money they spent exceeded their expectations. I get packets of different colors and shapes of the Alphabet stickers at Walmart and they last for at least 6 to 9 months. I always go to Clearance sales at Michaels and get stickers, sheer fabrics, ribbons, bows & anything that would look adorable on a package. Clearance prices are so inexpensive that it comes out cheaper in long run than to to buy tissue paper at cost. During Holidays I add fun xmas, Halloween, Valentines, Easter etc..Earrings & I slip them on the bows on Top of the packages. I buy them after each Holiday for up to 80% off and save them as I always end up needing to use them. I’ve wrapped over 300 packages that I’ve got it down to a Science and can get anything wrapped under 15 minutes. The hardest part is to decide what colors or Ribbons to use. Lol, No package is ever the Same. Always different as I continue to learn different fun ways to wrap & Design.Customers love it and return to buy again. I also get Scarfs at Macys Clearances (as low as 99 cents with added coupons and wrap retuning Buyers or large bundle Buyers with tissue than use the cute Brand Scarfs to wrap the clothes around on top of the tissue as an added gift. It sounds expensive but the way I buy its pennies on the dollar. It’s fun as decorating is my passion and Customers love the personal added touch because it makes them feel Special. I had a buyer tell me in my “Love Notes” that they have never recieved anything so beautifully wrapped before, not even from friends or family. Lol, I love the special touches & I know thats what has built my returning customer base. It’s easier & Cheaper than it looks. It shows you not only take pride in your customers but also shows pride in the care of Clean Quality Clothes Customers want and deserve. 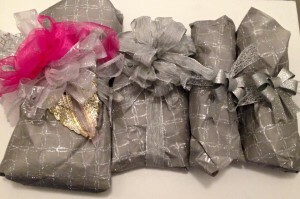 Bethany truly embraces the unique nature of Poshmark by wrapping her packages differently based on what she has on hand and what deals she can find on pretty things to use. It’s a testament that you can put together a gorgeous package without spending tons of money on it! Check out Sherre’s Poshmark closet here! Take care with your packaging that whatever you use won’t damage the clothes or accessories being shipped. Colored tissue paper can sometimes bleed onto white or light colored clothes if the box happens to get wet. So layer it with something white or something that won’t bleed ink underneath. Avoid using anything that is sharp and could rip or tear a clothing item. And while glitter is super fun (I LOVE glitter), if it’s too loose, it can get all over the clothes and can sometimes be hard to get out. If you decide to use glitter in your packaging, make sure the clothes are securely wrapped in something else, like tissue paper or butcher paper so they will stay clean. Don’t stress too much about making your packaging absolutely perfect. Some tissue paper and a hand written card will often do the trick. But it really is oh so much fun to come up with something really beautiful to send out. Keep an eye out for deals on packaging supplies while you’re out doing your regular shopping and don’t be afraid to experiment with some unique ideas. What is the coolest package that you’ve received? What kinds of supplies do you like to use in your packaging? Feel free to share your experiences/thoughts in the comments below! I love all your advice. You’ve helped me so much!!!! I’ve only been selling on Poshmark for a little over a month but I’ve read all your blogs twice. I realized this morning that I need to redo some of my pictures. Thanks for your help!!! Do these packages get shipped as is or are they then added to a box? Love the tips and inspiration!